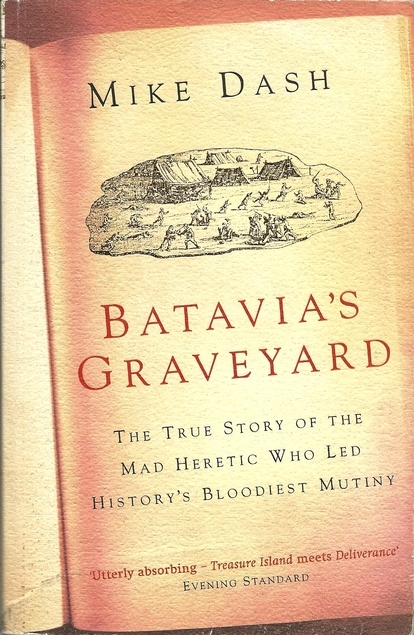 Batavia’s Graveyard by Mike Dash is a book that I would almost certainly never have picked up to read – but my brother gave me it to read while I’m here staying with him in Holland. The book is subtitled THE TRUE STORY OF THE MAD HERETIC WHO LED HISTORY’S BLOODIEST MUTINY. It’s the story of the shipwreck of a Dutch East Indiaman called Batavia in 1628. It was a time when shipping in the Netherlands/Holland was a huge part of the country’s character, something that I had never really thought of before with my ‘Britain ruling the waves’ education. Completely silly really when you remember that Tasmania was ‘discovered’ by a Dutchman and they rivalled Britain with their empire in the East Indies and elsewhere, such as the Caribbean. As ever though, it was a harsh life aboard ship for the ordinary sailors who were doing the actual work for very little money to get to the destinations. Keelhauling and lashing were common punishments for small misdemeanours and consequently mutinies were quite frequent. As Batavia sailed out on her maiden voyage she was full of treasures bound for Java, as well as some disgruntled and murderous ship’s company. Mutiny was being planned by some of them but before it took place the ship struck a reef just off an unexplored chain of islands off the coast of Australia. Miraculously most of the passengers and sailors managed to get to the islands safely, but water was nowhere to be found and so those in a high position within the VOC – the very powerful company who owned Batavia sailed off in one of the ship’s longboats to seek help. Of course they were just making sure that they wouldn’t die of thirst on an unknown island. It wasn’t long before the would-be mutineers took over and mayhem ensued. This is a gripping account which the author has managed to piece together from the many documents that still exist, from survivors and mutineers too. Apparently the history of this shipwreck is well known in Australia and Holland, but it was news to me and I found the book to be a gripping read and I’ll be trying out some more of his books. Have you read anything by Mike Dash?